There's not a lot of love for Moonraker, which is odd considering it's one of the highest-grossing 007 movies. Of course, according to the end credits for The Spy Who Loved Me, it should have been For Your Eyes Only next. But, 007 movies often try and follow a trend in movie-making during the Roger Moore era and this one came about because of the big box office of science-fiction films that were doing the rounds. Ian Fleming had actually written a movie treatment of Moonraker way back before the franchise existed, to try and see his books make the leap from the page to the screen. But, as is sometimes the way, when it actually did, Ian Fleming had been dead for over a decade and the movie merely took the title of the book and the name of the villain to use for an original story; in which proto-Nazi Hugo Drax tries to create another Aryan race. So, what's so wrong with it? To be honest, on a re-watch, there isn't a lot that stands out as poor. The about-turn of Jaws, who becomes more of a friendly ally than a frightening henchman (mainly at the insistence of director, Lewis Gilbert, who knew that audiences – especially small children – loved the character), is perhaps a misstep but one that makes sense at the time, given how well remembered Richard Kiel is for stepping into the huge shoes of Jaws. The outer space sequences are handled well and don't appear until the last third of the film. In fact, the special effects model work on those – by Derek Meddings - was nominated for an Oscar, so it can't be that bad! It's also got one of the rudest and most amusing lines given to Q at the end of the film (“I think he's attempting re-entry, sir.”), which I'm not quite sure how they got away with. With the previous film's success with the car-to-submarine Lotus Esprit, Moonraker gets the not-quite-so-successful boat-to-car scene when Bond's Gondola leaves the canals of Venice to motor across the famous square. The pigeon doing a double-take is one gag too far, even for a Roger Moore film. So, there's elements of outlandishness that veer close to tipping the film over into parody but you can't help but love it for the tongue-in-cheek facade that it's adopted. If you're going to fire 007 into space, you might as well make the lead-up equally as fantastical. The story itself isn't too shabby, even if it does lift elements from other popular Bond plots (and feels a little like a re-tread of the previous film). Hugo Drax – played, in an almost terminal loquacious manner, by Michael Lonsdale – intends to inhabit an orbiting space station with 'perfect' humans, kill off the entirety of Earth's population, and then start civilisation once again with these hand-picked specimens. Unfortunately, like the most recent Indiana Jones film (The Kingdom Of The Crystal Skull), planting a solid action-man hero, who's veering on parody, in direct relation to extra-terrestrial happenings throws the balance off. But, as I say, it's only at the end of the film that we see Bond go into space. Beforehand, there are some fantastic sequences where Bond is snooping around Drax's laboratories and survives several ingenuous murder attempts. Roger Moore's settled perfectly into the role after the global smash of The Spy Who Loved Me and this style of 007 fits him like a well-tailored tuxedo. His female companion, CIA Agent and Drax's secretary, Holly Goodhead (even Austin Powers couldn't out-do that stinker of a sexual name), is played by Lois Chiles. Well, 'played' is quite a strong word. 'Under-played' is probably more appropriate. Apparently, she was going to be cast as Russian agent Anya Amasova in The Spy Who Loved Me but had gone into semi-retirement. Without being mean, she may well have had no choice in the matter as it's a struggle to see how someone acting so wooden could have sustained a career. Barbara Bach was the perfect choice for the Anya role and, had they gone with Lois Chiles, I'm not sure The Spy Who Loved Me would have been considered such a classic. On the production side, John Barry contributes another fantastic score, very in-keeping with the tone of the movie itself. He adds in many musical jokes, including little nods to film scores such as Close Encounters Of The Third Kind and 2001: A Space Odyssey. Shirley Bassey returns to sing the title track but, apparently, was never particularly happy with it as she'd been brought in at the last minute when Johnny Mathis – who had been recording with John Barry – dropped out a few weeks before the film was to premiere. As mentioned before, Derek Meddings and his team create some absolutely amazing special effects for all the outer space sequences and rightly were nominated for an Oscar for doing so (losing out to Alien). Plus, Lewis Gilbert as director keeps a firm hand on the megaphone for his third 007 film and Ken Adams supplies some brilliant set design from the usual brief of 'expensive and expansive'! 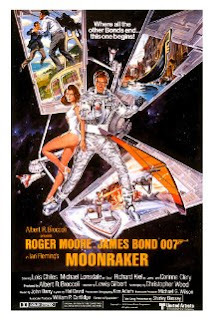 So, Moonraker may not be everyone's cup of lunar tea but it's still a solid (re)entry in Roger Moore's twelve-year tenure as the gentleman spy.